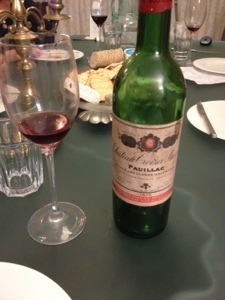 To celebrate hand over of the new WC website an old bottle of Pauillac 1970 Croizet Bages still fruit, slightly burnt notes, liquorice, amazingly lively. Now onto the last bottle of Varoilles 1er cru Gervrey Chambertain 02……. Categories: news, tasting notes | Tags: bordeaux, paullac, Tasting notes | Permalink.